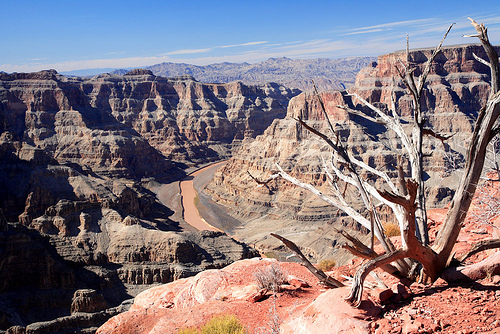 Outstanding hikes down into the world’s most famous canyon, or along its rim. Revel in huge views across the vast canyon; enjoy the changing colours and fantastic shapes of the cliffs, buttes and spires. Enter another world with wildly varying ecosystems as you plunge deeper into the great abyss. 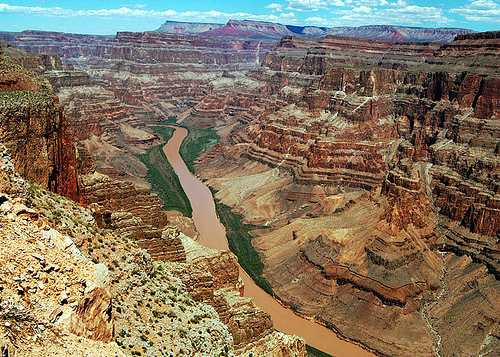 The Grand Canyon is one of the Seven Natural Wonders of the World, a World Heritage Site, and geological heaven. 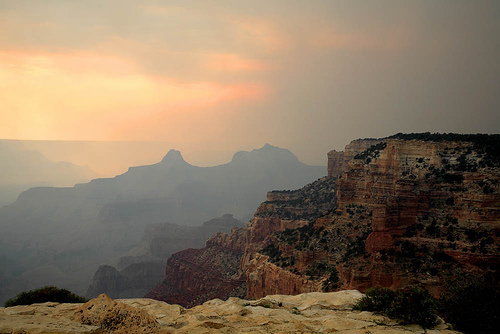 It is hard to overstate the canyon’s raw, majestic beauty and glamour, or the awe that it inspires. Its varied colours and outlandish shapes and formations are justly famous. 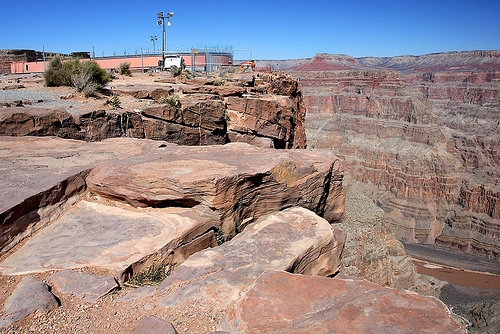 The sheer size of the Grand Canyon is astounding. Up to 1,830m (well over a mile) deep, 450 km long and up to 25 km wide, it is the one against which all other canyons are measured. The Canyon abounds in natural wonders: nearly 2 billion years of geology are revealed in its cliffs (although, amazingly, it took a mere six million years for the Colorado to excavate it), and you move quickly between different layers of history (young sandstone at the top, ancient granite near the river) and between hugely varied ecosystems, from the pine forests of the rim to the hot desert of the floor. There are areas of greenery such as the overpopular Indian Garden and the Havasu Canyon, where streams converge to produce rich and vivid vegetation. You will see birds of prey soaring on the Canyon’s thermals. Dangers and pests include rattlesnakes and scorpions. Layers of hard rock alternate with soft, resulting in vast cliffs and majestic buttresses above flatter terraces, the best known and most useful being the Tonto Platform. The Canyon contains various intriguing archaeological sites, including rock paintings and the detritus of old civilizations, indication that even the most inhospitable of places has long been lived in. The Anasazi people were here from the sixth to 13th centuries, other tribes from the 15th, one now occupying the remote and lovely Havasu Canyon. The Canyon gets around 6 million visitors a year, so its rim – and the main trails – can get crowded. Getting away requires effort, and planning. Walking the Canyon: there are many different ways to explore the Canyon: tough trails that cross its entire width, day hikes into the abyss, or walks which savour the outstanding views from its rim, although you will not be alone. 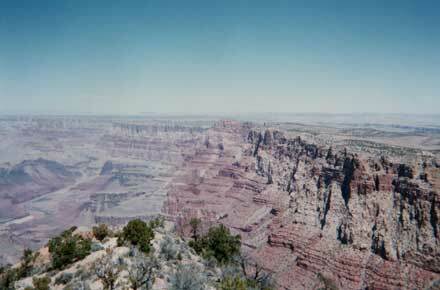 A wonderful way to appreciate both its immense size and beauty is to walk across the Canyon, or at least deep into it. A hike deep into its bowels will, though, test both your physical and mental fortitude with its extreme heat, steep climbs and tough trekking. 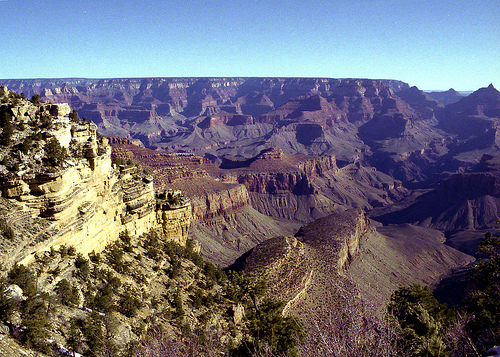 The cross-Canyon route is the South / North Kaibab Trails. The only bridge over the Colorado is on these trails, near Phantom Ranch, so crossing here is your only realistic option. 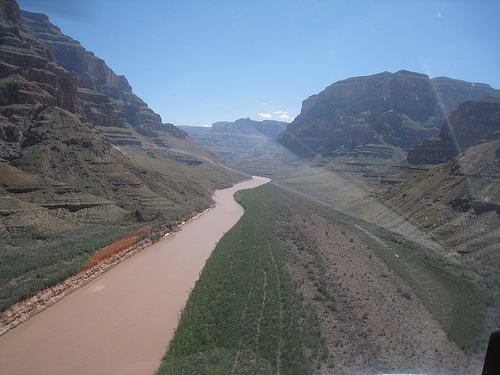 The North Kaibab Trail is the only recognised path in the centre of the NP between the North Rim and the river. You can walk either way. 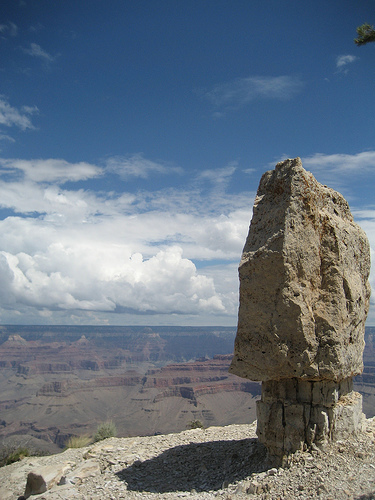 You can also walk down/up on the Bright Angel Trail from the south, which joins the South Kaibab Trail near the bridge. The crossing is mainly walked south-to-north, although vice versa is perfectly workable. It usually takes 3 days. See our Crossing the Canyon page. 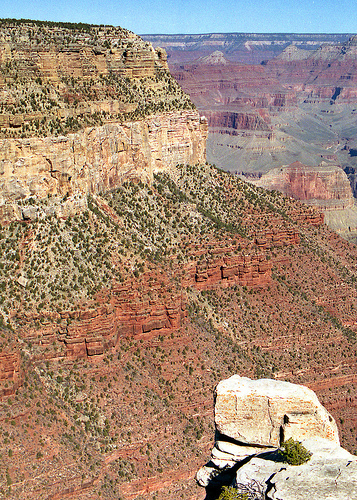 The best known and most-used trails are the South Kaibab Trail and the Bright Angel Trail. These are wide and well-constructed routes, called the ‘corridor trails’, and are the recommended routes for first-timers as they are well maintained and even patrolled. But they can be very crowded at peak times. Experienced walkers should be able to use less-frequented trails, such as the Grandview Trail, even if it’s their first time. There are many other trails into the Canyon. The Tonto Trail ​(and to a lesser extent Escalante Trail), which wind along the Tonto Platform on the Canyon’s southern mid-slopes, are useful links for many of these trails, enabling circuits and all sorts of combinations to be made involving, for instance, descents on one path, overnighting in the canyon, and returning by another path. E.g. what we call the Grand Day Loop. How deep you go depends on how fit and experienced you are. See more below. Bright Angel Trail: a wonderful name, but it is very crowded as it starts from Grand Canyon Village. The trail makes a quick initial descent, on endless beautifully constructed switchbacks inside the deep canyon-recess of the Garden Creek, then levels out toward Indian Garden. Pass various lookouts, which can make logical turn-rounds. Indian Garden is a delightful canyon-bottom oasis, with green trees and running spring water, but is very crowded at peak times. Most people stop at Indian Garden, but you can continue on to the Colorado, dropping steeply down the the inner canyon - only recommended for the super-fit and very experienced. If you think you have the legs, do make the level, 3 mile round trip from Indian Garden to Plateau Point, for dramatic and magnificent views of the Colorado river. The return hike from deep down is a long slog, but much assisted by the brilliant construction of the trail. South Kaibab Trail: beginning to the east of the visitor centre, the trail makes a steady descent, dropping 6+ miles down through nine layers of the Canyon. Unlike most trails down, which follow side canyons, the South Kaibab Trail sticks to ridgetops, so you get huge views much of the way down (we think it is the better route for this reason). Across the sloping Tonto Platform, the scene of the eponymous lateral trail, you drop steeply to the river – only recommended for the super-fit and very experienced. You can then cross to Phantom Ranch or the Bright Angel campground and then back the next day, or on along the North Kaibab Trail to cross the Canyon. The return hike from deep down is a long slog, but much assisted by the brilliant construction of the trail. 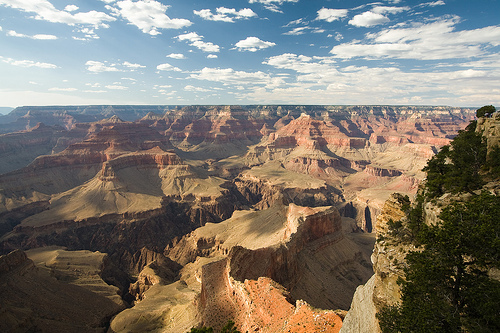 A popular alternative is to use the Tonto Trail to connect the above routes to create a Grand Day Loop: is this the best day walk in the Grand Canyon? Walkopedia thinks so. 13-16km of visual rapture. Descend the South Kaibab Trail to the Tip-off. This is the better descent, as the trail follows a ridge most of the way down, so has superb and wide views. Traverse from the Tip-off to Indian Garden (on the Bright Angel Trail) on the brilliant Tonto Trail, which is beyond delightful; then it is the long ascent of the Bright Angel Trail back to the Canyon Village.If you think you have the legs, do make the level, 3 mile round trip from Indan Garden to Plateau Point, for dramatic and magnificent views of the Colorado river. 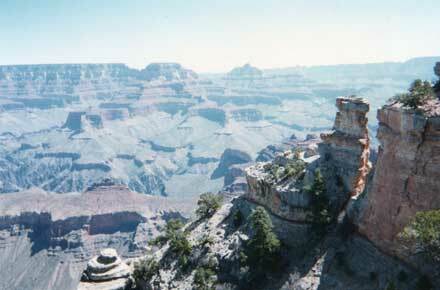 Another possibility is to spend a night at the bottom, then reascend to the South Rim. Note that accommodation at the bottom needs to be booked ages in advance. The Tonto Trail meanders, relatively level, for approximately 70 miles along the Tonto Platform, deep in the Canyon, and sometimes alongside the Colorado river. It connects with tracks all over the sprawling canyon complex, enabling circuits, loops and plenty of other options. 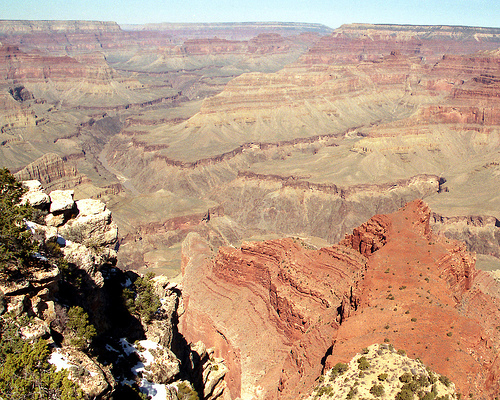 The Tonto Platform is a long and rugged plateau of harder, slower-eroding, rock, which separates the inner gorge from the cliffs and buttes of the upper canyon. If every viewpoint along the Canyon’s rim opens up breathtaking new panoramas, the vistas from within its entrails offer entirely new and exhilarating perspectives. You can feel as if you are at the heart of a huge bowl, surrounded by mountains, or in a long wide valley between marching escarpments, such is the size of the place. The North Kaibab Trail is the only way to access the middle of the Grand Canyon from the North Rim, down the long, straight, stately Bright Angel Canyon to Phantom Ranch and Bright Angel Campsite near the Colorado river. Walkable in part as a day walk, or stay the night down there. The Hermit Trail, from Hermit’s Rest to the west (shuttle bus available). The Hermit Trail is tough, demanding even for experienced canyon walkers. Originally built by horse thieves, there are major obstacles and descents, and hair-raising drops. The path is not officially maintained by the park rangers, and is at the mercy of natural and manmade erosion. The trail descends into the canyon steeply, past the usual wondrous and weird formations, before meeting the Tonto Trail about 6 miles in; a few miles further is the Hermit Creek campsite. Stick with the trail right up to its stunning finale – the Hermit Rapids on the Colorado River – and then return the way you came, or along Tonto Trail to pick a different route back up. The Boucher Trail, via Hermit and Dripping Springs Trails: The Boucher Trail is tough, with gradients exceeding 25% in places. It is, however, less travelled than many, and dips down into the same stunning scenery and geology as its more famous sister trails. Some of its more dramatic features include, after just a few miles, contouring around beneath Yuma Point; a steep descent through the Supai Group to the head of Travertine Canyon; the climb east out of Travertine Canyon to the Whites Butte saddle; the natural fissure in the Redwall Limestone that leads to its junction with the Tonto Trail and platform (in 8+ miles); and the narrow Boucher Creek itself that splits off and down to the Colorado River at the trail’s terminus. Return to the Tonto Trail to choose an alternative trail back to the rim. The Grandview Trail, from Grandview Point parking area a few miles east of the visitor centre: The Grandview Trail opens with a quick descent on switchbacks through Kaibab Limestone and the Toroweap Formation, generally following the ridge that marks the fault in the Coconino Sandstone. Thereafter a turn to the north means a further descent, this time through the Hermit Shale and Supai Group until it reaches Horseshoe Mesa. You’ve just descended 2,500 feet in around 3 miles. After the Last Chance Mine, an eastern steep spur track leads down through the Redwall Limestone break, heading east past Miners Spring to its rendezvous with the Tonto Trail just over 4 miles later, and then east to the flow of Hance Canyon. Following Tonto Trail westward, you can pick up a western spur of the Grandview Trail, following Cottonwood Creek up to an alternative break in the Redwall Limestone, making a loop back to the Horseshoe Mesa camp and the trail back to the South Rim. To the east, the New Hance Trail and the Tanner Trail from near the Desert Lookout Tower are both fine (and less used) descents to the Colorado. As neither have camping facilities, they both need to be walked in a day, so plan accordingly and don’t descend beyond your powers of return. In the far west of the central area are the little-visited and hard-of-access Royal Arch Route and South Bass Trail. Thunder River/Deer Creek Trails In the far north-west of the park, accessible from the North Rim. The Havasu Canyon in the west is outstandingly beautiful, and (relatively) remote. Waterfalls, bright blue mineral pools, lush greenery; and a long history of American Indian occupation. You have to camp near the famous Havasu Falls. Permits needed. Note that many of these will make very long and tough days if tackled in their fullest extent, so be realistic about your capabilities. Many of these trails can be linked by the Tonto Trail to make a marvellous if long day circuits. 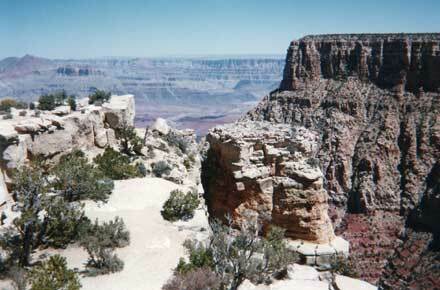 Hiking on the South Rim is limited (which is very tedious) to the Rim Trail and the short Shoshone Point Trail. The views are wonderful, though, and may be worth mixing with the throngs of tourists for. 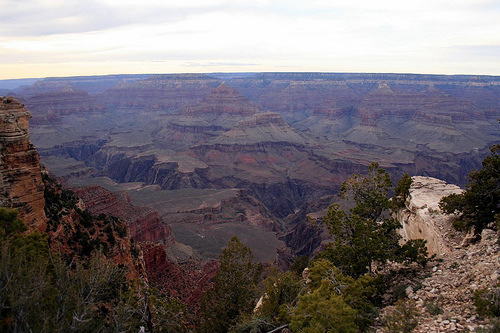 Things are more relaxed and varied on the North Rim. See below. The Rim Trail runs for 13 miles between the South Kaibab trailhead near Yaki Point to the east of the visitor centre and Hermits Rest some 7 miles west of Grand Canyon village. It joins together a series of amazing viewpoints, running close to the cliff-edge most of the way. It is paved for much of its way. It is, needless to say, crowded on a quiet day and hideous at busy times. Despite this, you can't possibly not walk some of the rim. The further you go west of the village, the (relatively) fewer the people on the trail. You do need to watch at least one sunset from the rim, although, again, don't expect romantic solitude. There are plenty of fine trails which lead out to sublime viewpoints – just look at a map to find one to suit you. The only significant rim-top trail is the Widforss Trail. This can be tough walking in hot, dry conditions. Come fully prepared, including carrying plenty of water. Make a realistic assessment of your capabilities and the demands of the trails. Remember that you have to get back to the rim: “Descending is optional; ascending is compulsory”, as the signs say, approximately. The Cicerone guide has good information on all these walks. Find these and other books on Amazon.